i … because of my tattoos! 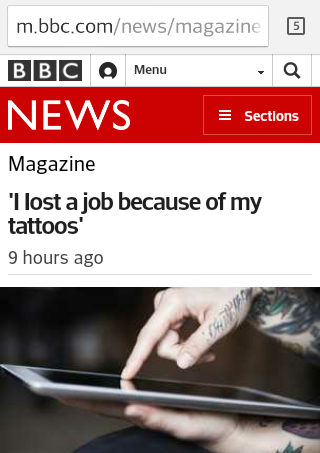 This article posted on BBC struck a chord with me, of course, seeing how barely a few months ago I lost my own job because of my body modifications! I can totally relate to the stories in this article and despite feeling hurt and unjustly treated I still hope that there are more open-minded and accepting people out there and those too closed-minded to actually understand that people differ from one another don’t deserve much respect! Body modifications are more than just some people’s prejudices! Dress code is still a hot topic and it’s been of special interest for me lately (no wonder!). there’s an optimistic approach to the issue and the opposite view as well. ‘Diversity’ in the workplace is another interesting topic worth some of our time and thoughts. Diversity can be about so many things after all and everyone, no matter their beliefs, gender, looks or dis/ abilities etc. should be treated well! Tattoos and people’s meanings behind here! Poland 🙂 some reports from the recent Cropp Tattoo Convent in Katowice.